The Bay SportsMed WaiBOP United Youth Team has fallen to only its third, yet heaviest, defeat of the ASB Youth League in the final match of the season. The visitors, Waitakere United, stormed out of the blocks, scoring twice in the first eight minutes. WaiBOP settled then grabbed a goal back through Jono Viviani to make it 2-1 at the break. WaiBOP had a great chance to get level just after the restart, forcing a fine double save from Waitakere’s keeper, before the visitors went literally straight down the pitch to score their third. Jevon Williams pulled WaiBOP back into the game after nudging home a free kick but as the game opened up, and each side lost a player, it was the visitors who were able to finish the strongest. 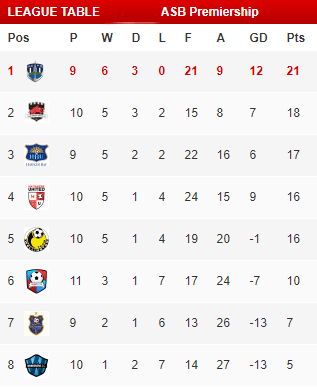 The win lifted Waitakere into 2nd place in the Northern Conference at the end of the season. WaiBOP United squad: Ruben Parker-Hanks; Joe Nottage, Shaun Morgan, Matt Wheeler, Liam Williams; Jevon Williams, Xavier Pratt (Nathan Kinney), Jama Boss; Wade Molony, Jacob Robb (Connor Probert), Jono Viviani (Luke Searle). Subs (not used): Scott Hilliar, Reid Drake. WaiBOP United would like to thank our youth team’s coaching staff and management. Paul Drake, Paul Probert and Graeme Kinney put in countless hours and travelled untold miles, all at their own cost, as they put together a good youth team set-up that should bear fruit in future seasons.